Lactarius badiosanguineus is a European species, associated with spruces (especially Norway spruce) in boreal and montane ecosystems, and not generally reported in North America--probably because Hesler and Smith (1979) did not address the species in their epic study of Lactarius on our continent. The species is characterized by its dark brownish red, shiny cap; its orangish gills; its mild to slightly acrid, white milk; and distinctive microscopic features (see below). 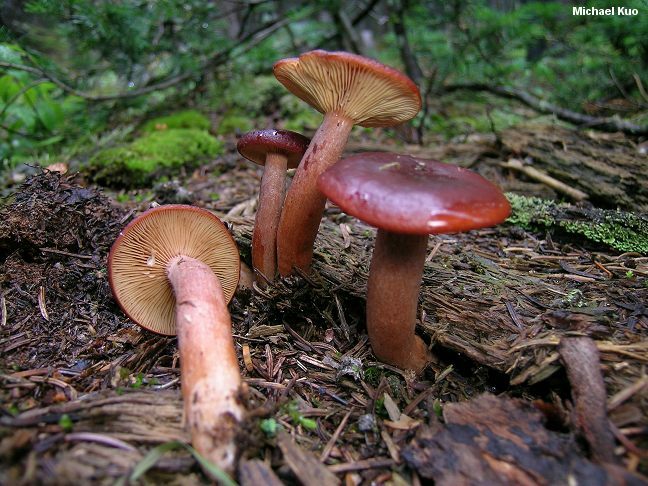 The illustrated collection was made, not in Europe, but under Engelmann spruce at high elevation in the Colorado Rockies, and is an excellent match for the morphological species Lactarius badiosanguineus as described by European authors. 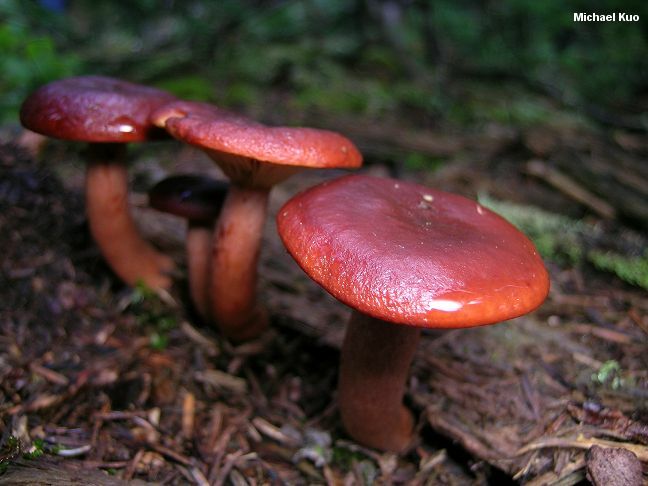 Recent molecular studies indicate it is unlikely that a North American Lactarius collection matches a European species--but the same may be said of Lactarius camphoratus, Lactarius uvidus, and a host of other "North American" Lactarius species that are clearly closely related to European species but await contemporary study and renaming. Lactarius hepaticus is similar, but has a duller, browner cap that turns olive with KOH; it associates primarily with pines. Lactarius luculentus var. laetus is more orange, and features gills that develop brownish stains. Lactarius rufus is very acrid and features a cutis rather than a trichoderm; it grows under pines. 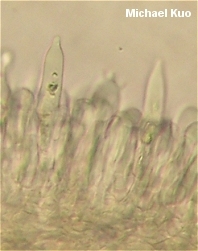 Ecology: Mycorrhizal with spruces, firs, and perhaps other conifers; summer and fall; in North America reported from Newfoundland (Malloch, 2010) and, here, from Colorado. Cap: 2-8.5 cm; broadly convex with an inrolled margin when young; becoming flat, shallowly depressed or shallowly vase-shaped; greasy to dry; shiny; bald; deep brownish red to reddish brown; evenly colored to the margin; without zones of color. Gills: Attached to the stem or beginning to run down it; close or crowded; pale orange or yellowish, becoming dull cinnamon with age; not bruising. Stem: 3-9 cm long; up to 1.5 cm thick; more or less equal; dry; without potholes; colored like the cap, but paler. Flesh: Whitish to pinkish; not changing when sliced. Milk: White; unchanging; not staining white paper yellow. Odor and Taste: Odor not distinctive; taste mild or slowly, slightly acrid. 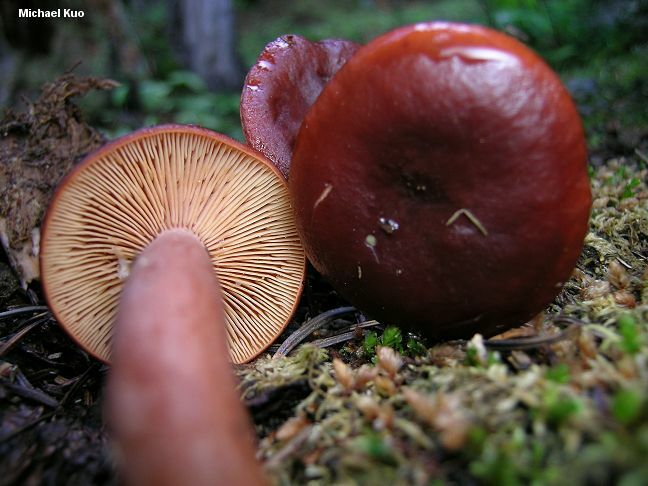 Dried Specimens: Dried caps and stems are dark brown, without any trace of red; gills are dull orange. 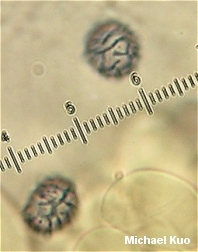 Microscopic Features: Spores 7-9 x 5.5-7 µ; broadly ellipsoid; ornamentation 0.5-1 µ high, as amyloid warts and connecting lines that form distinct stripes and subreticulate patterns. 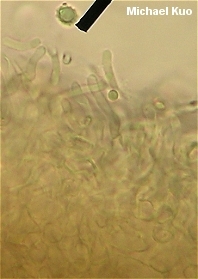 Pleuromacrocystidia abundant and prominent; subcylindric to subfusiform; to about 100 x 10 µ. Cheilocystidia scattered and inconspicuous; subcylindric to subfusiform; to about 40 µ long. Pileipellis an oedotrichoderm, slightly gelatinized. REFERENCES: Kühner & Romagnesi, 1954. (Moser, 1983; Hansen & Knudsen, 1992; Heilmann-Clausen et al., 1998.) Herb. Kuo 08100705.